Arsenal's fabulous run of form continued on Saturday with a 2-1 win over Swansea in Wales, running the Gunners' unbeaten streak to nine games across all competitions (semantically speaking, Arsenal have won all nine of those games, but statistically speaking, a match that is decided by penalty shootout is a draw.) Arsenal play twice more between now and the next international break; first, they will focus on Europe. When you're in a group as difficult as Group F this season, the value of home games becomes that much more important. 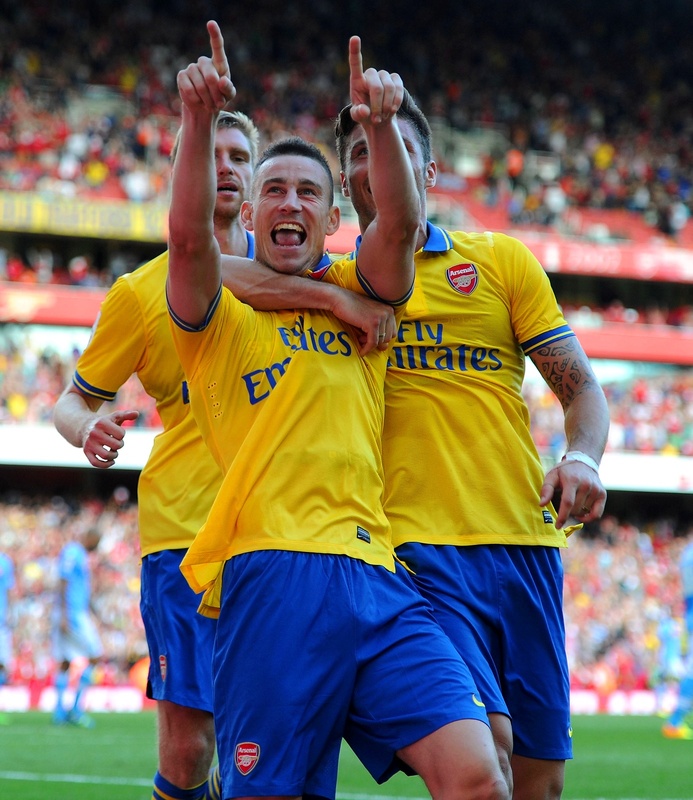 Arsenal are off to a good start, claiming three points on the road in Marseille on Matchday 1. If the Gunners sweep their home games, they'll finish with at least 12 points in the group, which should almost certainly be enough to qualify for the knockout stages. With back-to-back matches against Borussia Dortmund looming in the distance, Arsenal's Matchday 2 encounter with Napoli at the Emirates has its importance magnified even further. An Arsenal win puts them alone at the top of the group with one-third of the games already played. A loss puts them in second or third, depending on the goal difference in the Dortmund-Marseille game. A loss would also demand Arsenal get a result on the road in Dortmund or Naples to climb back into the race. Any way you look at it, this is a surprisingly critical fixture for Matchday 2. Napoli started the group well as Dortmund imploded two weeks ago. 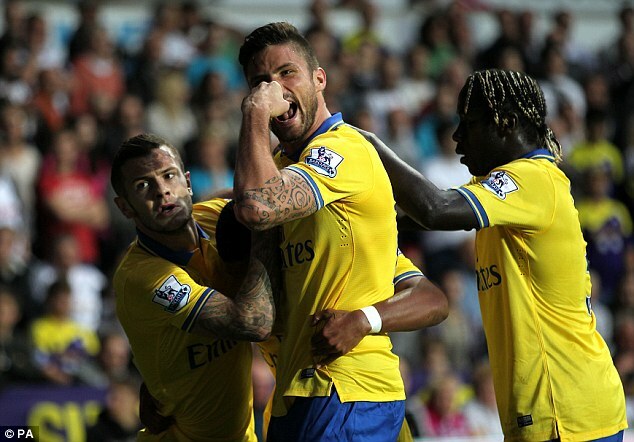 So, will Arsenal continue their run of form and grab a stranglehold on the Group of Death? Or, will they crash to a halt and make everything tricky again? The floppy haired Czech midfielder will likely return tonight. Well, the news is improving regarding injuries: Tomas Rosicky is back and Arsenal haven't lost anyone to compensate! The injury list is down to six! High fives all around! Woooo! With Rosicky available, the question is if he and/or Mikel Arteta get a start in midfield. With Arsenal's next game not until Sunday, it's not really a question of resting players in advance of playing West Brom, it's more of an issue of resting those who might still be knackered. You would think Serge Gnabry would be the first to drop out, but this club has a shocking number of wide players unavailable. If Arsenal had a starting midfield five of Arteta, Aaron Ramsey, Jack Wilshere, Mesut Ozil, and Rosicky, they would have to play remarkably narrow. That would require more up-and-down the pitch movement from the wingbacks, leaving Arsenal exposed at the back against a Napoli squad that looked lethal on the counter when they played in the Emirates Cup. Rosicky's return brings about an interesting conundrum for Arsene Wenger: if he comes back, who comes out? I don't think that question has a very easy answer, and Wenger may simply choose to retain the starting XI then bring in the likes of Arteta and Rosicky off the bench. There were reports that Santi Cazorla could be back for the weekend; I think that's wishful thinking. Or, perhaps more accurately, if he does return for West Brom, he'll be called up by Spain and Arsenal doesn't want that. Theo Walcott will miss three to five weeks after stomach surgery (hopefully that's not on the Diaby calendar.) Lukas Podolski might be back by the end of October if we're lucky, but it's longer for Alex Oxlade-Chamberlain. What are the odds Higuain scores? Good? Rafael Benitez was able to rest a number of his key starters at the weekend as Napoli beat Genoa 2-0; Gonzalo Higuain arrived from the bench in the 59th minute. Marek Hamsik and Blerim Dzemaili are both expected to return to the starting XI. Napoli have only one injury concern: full back Christian Maggio will likely miss out with a knee injury. Maggio has not played since Matchday 1 against Dortmund; Giandomenico Mesto has started in his place. Under Benitez, Napoli have shifted to your standard 4-2-3-1 formation, after playing with three at the back under previous manager Walter Mazzarri. Napoli used to sit deep and rely on the counter but now play with a bit more possession (though they retain that threat on the counter-attack.) The visitors will likely target Arsenal down the wings, using Goran Pandev and Jose Callejon out wide flanking Higuain up front. "I'm pretending I have giant ears!" These two sides come into this match having lost just one match combined, Arsenal's opening day 3-1 loss to Aston Villa. Napoli are unbeaten in seven matches to start their season; their only blemish is a 1-1 draw with Sassuolo on September 25. Arsenal summer transfer target Gonzalo Higuain had gone four consecutive matches with a goal before coming up empty in that aforementioned 1-1 draw. Goran Pandev scored twice at the weekend in a 2-0 Napoli win over Genoa. Napoli are second in Serie A, behind first place Roma, Gervinho and all, who have won all six of their matches. Napoli plays Roma in Rome on October 19, straight after the international break. During their nine match unbeaten streak, Arsenal have scored multiple goals on seven occasions and have not conceded more than once in any single match. Arsenal did not have a great record at the Emirates in the Champions League last year, winning twice over Olympiacos and Montpellier, and losing twice to German sides, Schalke 04 and Bayern Munich, by two clear goals each. his arm around the goalscorer. This is the first competitive meeting between Arsenal and Napoli, though the two sides met in August in the Emirates Cup: Napoli struck twice in the first half on a couple of Arsenal defensive miscues to lead 2-0, but Olivier Giroud and Laurent Koscielny each scored within the final 20 minutes to earn the Gunners a 2-2 draw. Despite having never played Napoli before, Arsenal have 29 previous matches against Italian opposition. The Gunners have a record of 14 wins, seven losses, and eight draws against Italian sides. Out of 13 home matches, Arsenal have eight wins against Italians, two losses, and three draws. The last time Arsenal faced an Italian side in the group stages, it was 2003/04. Arsenal lost 3-0 to Inter Milan at Highbury, but famously won 5-1 in the reverse fixture at the San Siro. The other Italian side to win in London was Fiorentina, who won 1-0 at Wembley in 1999. In five matches against Italian competition at home since the 3-0 loss to Inter, Arsenal have not conceded a goal. Napoli have played a total of six matches against English opposition, winning two, losing two, and drawing two. Napoli faced Manchester City in the 2011 group stage, drawing 1-1 in Manchester and winning 2-1 in Naples. They then faced Chelsea in the Round of 16, won 3-1 at home, but lost 3-1 at Stamford Bridge, forcing extra time. Branislav Ivanovic's 105th minute goal saw Chelsea through on their way to the title. Previously, Napoli faced Liverpool in the 2010 group stage of the Europa League, drawing 0-0 at home and losing 3-1 at Anfield. 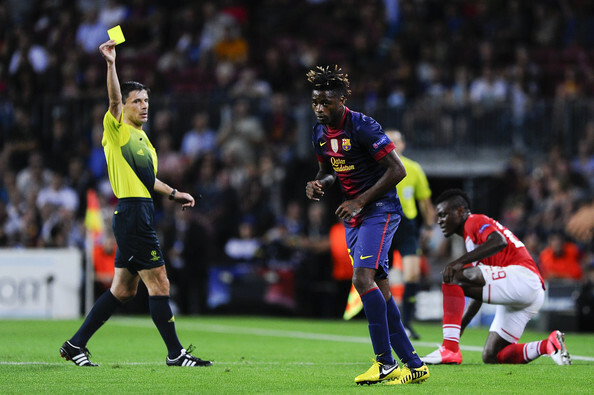 that Alex Song's hair somehow got worse at Barcelona. The match officials are from Serbia; the referee is Milorad Mazic. This will be Mazic's first match as referee for both clubs. Last year was Mazic's first working the group stage in the Champions League and he took charge of two matches involving English sides: Manchester United's 3-2 win over Braga at Old Trafford and Manchester City's 1-0 loss in Dortmund. He did not work a Champions League match involving an Italian side last year; in fact, he only worked four in total. Arsenal's German players will have a more recent memory of Mazic; he took charge of Germany's 3-0 win over Austria on September 6. * CSKA Moscow's match was moved due to poor pitch conditions at Arena Khimki.